Along the Trade Way's Northern Area, between Soubar and the Reaching Woods, a gruesome sight can be seen. Beheaded wolf corpses, many already rotting and eaten away by carrion-feeders can be seen, dotting the landscape. At a particularly prominent boulder on the road, there can be seen a circle of wolf-heads around the large rock. The structure itself has a symbol painted on it, the symbol painted in a crude manner using blood. The symbol is of a ring, the lines purposefully made jagged like that of a crown of thorns. The circle is dried well onto the rock and lies prominently on its side. Further along the road, into the dark and foreboding reaching woods, there lies a similar scene if one cares to tread there. Gnoll corpses, strewn around the forest are likely no strange sight as many adventurers come to this wood to hunt the seemingly endless plague of cretins. However, near the cave that the gnolls call home, there is a strange sight. On four trees surrounding the barricade and cave, there are circles painted. Each circle is made jagged, like that of a crown of thorns. The circles are drawn in blood, and judging from how some of the corpses seem to have had their guts and blood drained from them, it is likely the blood of these gnolls that the four circles are painted with. Having trouble making ends meet and keeping food on your plate? Looking to strike a name on the coast? Perhaps getting payed as you do? Within the Misty Forest, there lies a gruesome sight. Several orc bodies are strewn about, their chests brutally torn into and vital organs, including their hearts, removed. The bodies lie still and forgotten, partially eaten by the surrounding wildlife. In a certain profane grove, where bones lie on wooden altars in a ritualistic manner, there lies a central altar. Here, there are five hearts on the altar. Before the altar, there lies a symbol of a crown of thorns, scribed in blood. Malign Ashmeddai returns to the Winding Way Tavern, from a "business trip" to Baldur's Gate. The patrons of the tavern might notice that the normally confident tiefling appears harried and disoriented. His behavior seems to become progressively more peculiar as he continues to rent the room in the tavern tower. On a few occasions, the proprietor of the Winding Way enters his room and finds the tiefling muttering as he scrawls gruesome charcoal images on the floor and walls. When confronted about the mess, he grabs a bucket and scrub brush, proceeding to clean the room with well water and lye purchased from local merchants. Malign's meal times become increasingly sporadic. It is obvious that the "magi" seldom sleeps, the yellow irises of his eyes rimmed with red. It would be half a day later when a grey-robed woman entered the Inn. She made a few enquiries with Mag about the tiefling's welfare before gaining access to his room. She came out several hours later and left a considerable sum on money with Mag to pay for his room and board, as well as any additional expenses incurred. She only paused to read the flyer for the Ebon Blades before departing the Inn once more, her task there apparently complete, whatever that was. 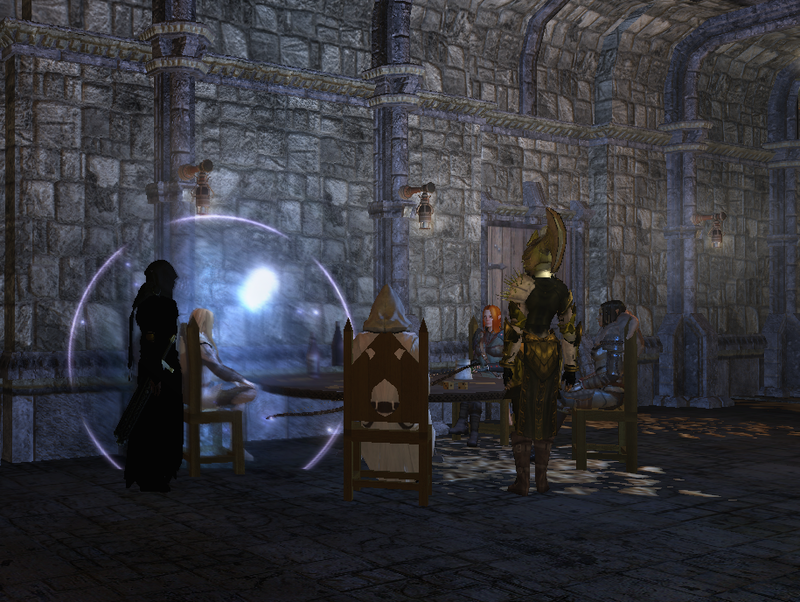 The next day, about the ninth hour of the morning, Malign Ashmeddai comes out of the Winding Way Tavern's tower room. Wearing a makeshift eyepatch over his left, the tiefling heads to the Soubar market. If asked, the 'magi' responds in a wry tone, "Let's just say certain wounds are unhealable, aye?" Fortunuately, Malign seems significantly less harried and erractic than before, almost back to his usual self. In the market, the tiefling purchases a better eyepatch and lye soap. Returning to the tavern room, Malign sets about cleaning it of further charcoal markings. He approaches Mag and is informed that the gray-robed woman paid for his room and additional expenses. However, the 'magi' continues to rent out the room on weekly basis and takes his meals at the usual times. The journeys he makes to Baldur's Gate and the Friendly Arms Inn continue on a semiregular basis. After returning to the Gate from Ulgoth's, Rania would wander into the Sorceries and ask the proprietor the oddest question: "Pardon me, sir, but would you happen to sell any sand from Mulhorand or if not, could you acquire some within the next week and a half? Thank you!" Rumor is a trickle from the North, but slowly the tale begins to spread of trouble at the Bridgefort- first the sound of a shriek from the tower, then the Northern Watch's Commander, and what seemed a new recruit fighting off a swarm of.... something monstrous that descended from the sky. There is also whispers of some sinister scene within the fort's tower, and the tower's upper floor being a cursed killing floor. Few details seem realistic, but they all agree that something's stirred the diminished Northern Watch into a grim determination. A certain Selunite might be seen roaming around the area of the Northern Watch camp, taking notes, sketching certain things, and then oddly removing several small glass jars from her satchel and collecting samples of this or that. Along with her is a golden eyed man with dark hair, both departing together after a group gathers to join them. It would be no secret that the Lieutenant of Bregan D'aerthe made an appearance in the Winding Way inn in Soubar. Those with an ear to such things, would realize that the blond drow mage known as Conjurer Vesche was back to leading the mercenary gang. An eleven woman in red with two scimitars wielded continuously wages a personal war in the Misty Forest. Her war seems to be with orcs, and sometimes trails of blood from her wounds are seen as she goes to a large tree that is located in the forest to recover. Upon her recovery she continues her war on the orcs until once again her wounds are nearly too much to bear. She again returns wounded, hurting. It seems her cycle is done in an isolated state, remaining solitary as her crimson armor always shines with spilled blood. Any who approach her would notice she seems guarded, as if fearing an attack on her at any moment. Her behavior reflects the actions of one who is hunted, though only a select few may know the reasons behind her actions. Word starts to trickle out of the North of a frantic fight that happened at the Boareskyr Bridge- numbers seem to vary wildly, but most seem to agree that the Bridgefort Tower was visited by a swarm of spectral entities. A mixed group of visitors and the Commander and Captain of the Northern Watch were hard pressed by the numbers for a time, but the brief siege was soon beaten off. One word that seemed to carry through all the rumors was simply "Dis". A hooded figure exits the magical portal, by the pillars on the Boareskyr Bridge. A pair of silver longswords are carefully strapped on his back along with a quiver full of silver arrows. On his side, a bear lazily follows his every step from a short distance. The ghoulish silhouette of a male priest of Myrkul dressed in funereal cerecloth and assorted death's head mask has recently made an appearance in Soubar. He conducts sanctified burials for the deceased and comforts the dying for a pittance; the less fortunate dead, with nothing to their name and no one to ask after them are not interred, however. Their bodies mysteriously whisked away in the dead of the night, never to be seen again. To those who would approach him, he introduces himself as Shroud Wearer Dazor. Despite his foreboding trappings, it would seem that he is a gregarious sort that welcomes company. It is currently unknown where he has made his residence, but his appearances that seem to occur only after dusk have given rise to rumors that he lives inside a coffin in Mag's basement.